Boyd first started getting involved in videography during his time as an undergraduate at the College of William and Mary in Virginia. He spent a lot of time in the Matoaka Woods that bordered the college and began filming animals and fauna that lived there, including owls, foxes, blooming orchids, and countless aquatic microorganisms. His interest in microorganisms started when he was a young boy. He was always interested in the smallest and weirdest looking creatures. He was also a big science fiction fan and was intrigued by the oddly shaped invertebrates and single-celled organisms that existed just below the water’s surface. As a scholarship applicant, Boyd’s challenge was to convince the Live Mas Foundation that supporting his education would have a broader impact. His passion stemmed from the fact that Boyd had noticed that there were a lot of filmmakers who followed and studied the larger and more popular animals, such as lions, tigers and bears, but that not many focus on microscopic life. He began highlighting microscopic organisms to show people that they go through the same challenges, and their lives have the same dramatic moments, as those of larger animals – struggling to find food, protecting themselves from prey, and reproducing. His goal is to use his skill at filmmaking is to educate the public on the microscopic world, so he combined his best footage of microorganisms with what he hoped would be a compelling narrative. 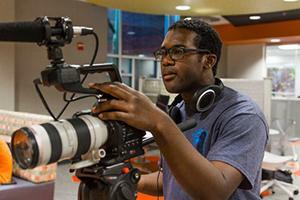 Boyd plans to use the money to help fund his education at SOC and navigate the wildlife film industry with the help of SOC’s Center for Environmental Filmmaking. He wants to increase his ability to create engrossing narratives about the microscopic world. He will also use a portion of the funds to help buy specialized equipment that will enhance his ability to film microorganisms. Boyd has a website where he showcases his videos on microscopic life and small organisms.